Having been using the Nexus 5 for over a month now, I can declare that this is simply one of the best Android smartphones you can get for your money. It isn't perfect. For example the lack of expansion slot is a bit of a downer. But the most galling example has to be the camera. Now, the quality of the camera's output isn't that bad if the conditions are right. But it's auto focus mechanism is iffy, especially on low light, and slow. Despite the inclusion of optical stablisation, you get all sorts of jerks. The white balance can also be a bit off, and the exposure compensation doesn't always work. I have had better pictures taken with the 8-megapixel powered no-OIS HTC 8X than with this device. 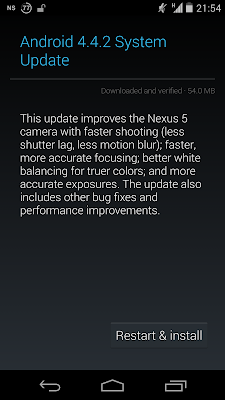 Thankfully the latest system update Android 4.4.2, aimed at improving the Nexus 5's camera, was released yesterday. Being the brave person I was, I downloaded and installed the update during my train ride home last night. The update was installed without a hitch, and ten minutes later the phone was rebooted with the new software installed. Bam! As I do not have two Nexus 5 to compare the old software with the new one, my observation of OS version 4.4.2 is merely subjective. The auto focus mechanism appears to be quicker, and also more accurate even in difficult lighting conditions. Shooting time is noticeably shorter, even in HDR mode. Speaking of HDR, the pictures produced offers better highlights and shadow details as expected. 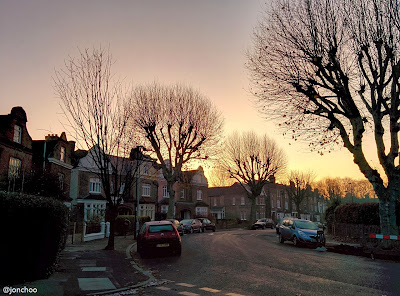 A far improvement over the pre 4.4.2 HDR mode, which does absolutely nothing, at all. Zilch! 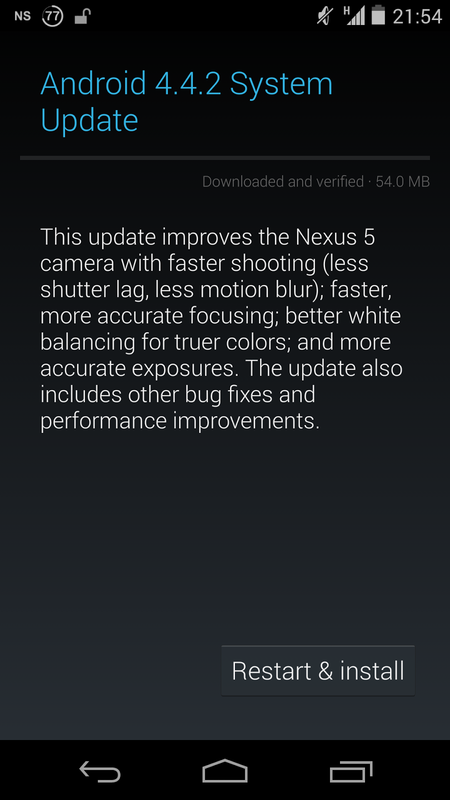 Overall Android 4.4.2 is a successful and much needed system update that addresses most of the issues with the camera. And while it won't turn it into a Lumia 1020, it has made it usable. Good job Google for listening to your customers, for once.